The temporary illustration of an 11th St. diverter during the Pop-up MANGo event, diverting westbound turns and through travel on Michigan, but allowing vehicle exit access eastbound. 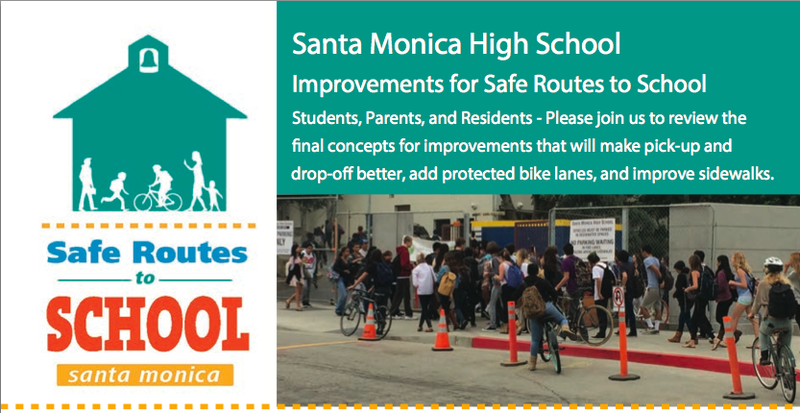 I am excited to see the Michigan Avenue Neighborhood Greenway (MANGo) proposal move forward with council approval, along with the connecting Safe Routes to School plan for Santa Monica High School. It has been quite a process, including some innovative efforts to solicit input and share concepts to the public including the Pop-up MANGo event, which set a new bar that exceeds anything else I’ve seen for street planning regionally. Many new treatments are proposed, such as small roundabouts at a steady rhythm in the corridor to reduce speeding, new planting spaces, and improved pedestrian crossings. There is one component that has been under consideration that has remained controversial with a number of people though, and which has been taken off the table without further study and later council approval; traffic diverters, such as was considered for Michigan at 11th St . I sincerely hope this tabling for the moment does not foreclose revisiting the idea. 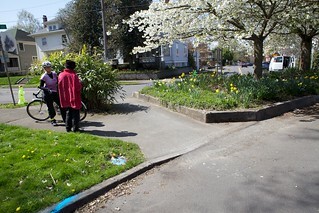 Diverters are a powerful tool in the toolkit of fostering calmed neighborhood streets, and have been part of the success of calmed greenway networks elsewhere, such as those I’ve visited personally in Portland, Oregon and Berkeley, California. A diverter forcing turns for motor vehicle traffic with curb ramp for bike through access, and ample planters and a prominent tree in Portland, OR. Traffic diversion comes in a few varieties, blocking car access entirely, or limiting turns, only allowing car exiting. Each of these can be installed in different ways and degrees of permanence and aesthetics. Looking through the Flickr search results for traffic diverter is a good way to become quickly visually aquatinted with that variety. In the context of goals of neighborhood greenway networks, based on comfortable sharing of street space for bicycling and motor vehicle traffic, they serve two key functions; reducing the number of car trips on a street, and they help reduce speeding because the trips they reduce most are through way access. Those most inclined to speed through in a hurry are often those with the least personal investment in the safety of the local street (although ideally we’d all care about the kids and people on every street). The concept behind painted “sharrow” markings is to visually reinforce the existing right for any bicycle traveler to ride any street regardless of specific provision of space specifically to bicycling. In practice this sharing works with the greatest comfort for the bicycle rider, and least aggravation and incidents of harassment by drivers, when both speeds and traffic volumes are low. High speeds are obviously hazardous and threatening, but volume is important too. Very low traffic volumes typically allow for passing with ample room and without any potential conflict from oncoming traffic (I have seen many close calls of drivers nearly slamming head on into another car in order to pass me on Michigan Ave.). In my experience, nearly all drivers always want to pass bicycle riders in any context, and no matter how fast I am going (and I am at times pretty fast, having done bike racing in the past), and if they are prevented in any way from doing so for more than fleeting moment, incidents of harassment have a tendency to escalate, tailgating, honking, shouting. It’s as though this latent ego trip that turns on with the ignition, regardless of whether doing so would exceed present speed limits, regardless if traffic is otherwise making progress no faster than the bicycle rider, or really any other consideration. There is a psychology to this “must pass all bicycle riders” phenomena worth visiting in it’s own right, but suffice to say, low trip volumes on greenway routes fosters lower stress sharing of space for all parties involved. When done successfully, as much of the Portland, OR network of such routes has demonstrated, they are often more popular for bicycling, and appeal to a broader range of riders and potential riders, than the typical minimum standard bike lane treatments on faster and busier arterial roads. Diverters are used alongside roundabouts to slow speeds, sharrow markings, and way finding signage to simplify what might otherwise be confusing turns to keep on the quieter streets. Most calmed streets feature far fewer car trips than is presently the case on Michigan Ave., although Michigan is certainly quieter than its adjacent Pico and Olympic boulevards. 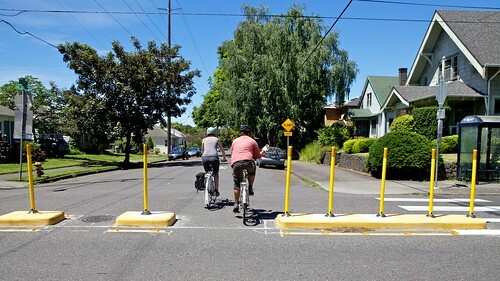 Yellow bollards is not my favorite look for diverters, but this one in Portland, OR is one of the better “action shots” I have of one in use for throughway bike travel. Diverters are the hammer in the tool kit, and as such shouldn’t be used excessively. But sometimes there just is no better tool for the job. One well placed diverter can often facilitate both lowering speeds and volumes almost single handedly across a given corridor. I’d love if LADOT would work a plan to place just even a single diverter somewhere on Ohio Ave., one of an extremely few non-arterial streets that crosses the 405 in the Westside, to reduce incidents of frequent cut through motorists harassing bicyclists trying to get to UCLA in the segment too narrow for bike lanes. I am encouraged to see the Michigan Ave. car trip volume target for the MANGo project was lowered, allowing for a possible discussion of diversion again later if the other calming measures and efforts to encourage bicycling to Samohi are insufficient in meeting trip reduction. Given the prevalence of Michigan as a cut through for the freeway, and the proximity to the Samohi, a diverter may be what it takes to bring that number down. 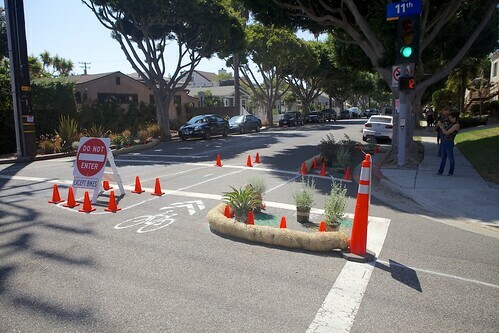 Traffic diverters are also not unprecedented in Santa Monica, although unfortunately where it has been applied in the past was not designed with seamless bicycling through access in mind such as those intended to serve as parts of bikeway networks. Examples I’m personally familiar with, include some streets immediately adjacent Santa Monica College including Pacific St., Grant St. and Bay St. where they each meet 16th. There is also the diversion of car traffic at Ozone Ave. at Glenn Ct. and 18th St. at Navy St. I’m sure other places I’m not as intimately familiar with in my typical navigation and routing around the city. Most of these local examples are full stop no access at those points, in, out or turn movements of any kinds, but there are many options and flavors for diverters that still permit certain car movements. One of the arguments against diversion is an assumption that present car trips will flow simply to other streets, however in practice traffic is a lot more nuanced than that. Some people who find the street more inviting to bike, might not drive a trip they formally would. A parent freed from chauffeuring a kid who is allowed more autonomy to travel with safer street connections, may stop showing up in the morning rush. Traffic does not simply flow and behave like water, and our streets are not pipes. There are multitudes of human choices at work at the individual and social level. In this way the language of calling it a diverter is itself slightly flawed. 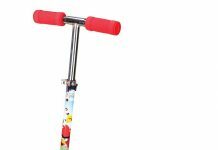 It’s not simply about changing course, but a diverter can be a component of shifting modes of travel entirely. Another argument against diversion that has come up is that it creates a burden for residents in the corridor who are more dependent on car travel in present circumstances, and will not bicycle. I do not find this particularly persuasive given that at most it introduces an extra couple turns to access a point beyond where diversion prevents straight through access. Once someone is already in a car and driving, a few extra right turns to loop around or route back home slightly differently is trivial compared to the effort bicycle riders in the city are constantly making to travel out of their way, under their own power, to avoid streets where bicycling is met extreme resistance. If we were to ask those residents living on streets where diversion already helps calm their street, if they would like the diverter removed to shave a turn or two off their route home, I suspect very few if any would want to make that trade off. In so many ways we add extra delay for those expending physical effort to get around, the bicyclist often seeking indirect routes that are less punishing, the pedestrian who does the same, or stands waiting a long time to cross where drivers refuse to yield , among other circumstances. I recently saw an old women trying to cross at an unmarked but legal crossing of Santa Monica Blvd., for whom routing further for a traffic light would certainly be a burden. Despite the aid of a younger woman with her, had a terrible time trying to get drivers to stop, it was cringe inducing to watch. It’s time to start flipping priorities around in at least some places instead of always car first, everything else further down. We can articulate sustainability on paper, but if we are to deliver on this necessary ambition, as well to place a greater value on protecting human life, a paradigm shift is required. 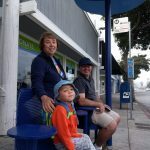 We are still short of such a paradigm shift if preventing minor inconveniences in select few locations while driving still takes precedence over some of the best practices for facilitating a shift away from cars, and improving traffic safety outcomes. We still have a ways to go, especially more broadly in the region beyond Santa Monica’s municipal lines, but it’s at least encouraging to see positive steps forward, such as the MANGo project will soon become. With or without the diverter, this is an important step, although I hope the topic can be revisited with a fresh perspective later should the car trip counts remain high.